I can tell you right away that his model has better badges, better mesh, fancy struts that hold up the engine hatch, and better looking latches. That said, all of that stuff is still present on my model, just at a lower degree. Both of our cars feature a removable top, but he can take off the nose cone and reveal all sorts of suspension goodness. His car also has a cool “MC12" banner across the wind shield that probably adds +50hp, at least. I’ve got two complaints about my car. The first are the wheels, which are just a tad too big and boarder on “Dubs” territory. They still fill out the wheel arches nicely, so I’ll give them a pass, but they just need a little more rubber. The second one is kind of a doozy. Those of you who have 1:18 Hot Wheels cars know that the models use both diecast and plastic body panels. Do you know what happens to white plastic? It eventually turns yellow. Its pretty faint, but you can tell in some of my photos here. The front facia, cooling vents on the sides, and the entire engine hatch are plastic, plus the removable roof panel. Do I regret not jumping on the sale that Androoo sent me on the AutoArt? Kind of. But I also need to eat food and keep my lights turned on. If the timing had been right, I probably would have but it is what it is. 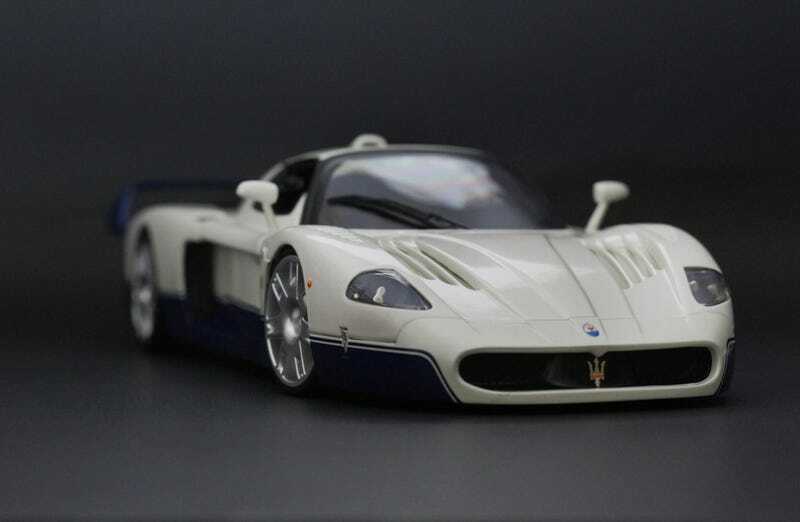 I already have this Hot Wheels one on the shelf and that satisfies my MC12 requirements for now. There’s also an even more rare HWE version of this car out there. Still a better looking car than the Enzo!